Livermore describes his successful speculative trades that led to his being "king for a day" and making his first million in the market. Livermore had been bearish on the market for some time, due to many economic factors that he studied that showed liquidity to be at a premium. The rest of the market was bullish, however. Rather than do what he normally would have done, which is plow into the market because he believed himself to be right, he waited for the right opportunity, using the techniques described in the previous chapter. When the bear market finally it came, it was so devastating to the market that extraordinary support from key banking officials was needed to keep the market from flat-lining completely. Livermore's legend grew as his net worth expanded, with traders around the country discussing his prowess. As the bear market continued and Livermore's gains continued to grow, Livermore was eventually asked by a key official to stop his selling out of patriotic duty, for the economy as a whole was likely to suffer if Livermore kept punishing the market. 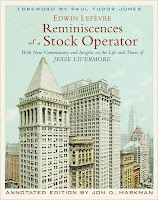 By that time, Livermore had already resumed covering his shares; but had he not, Livermore believes he singlehandedly could have destroyed the market (by continuing to short). At this point, Livermore believed that he finally learned to trade properly. He had advanced from bucket shop trading to trading on the real market, whereby study of macroeconomic issues went hand-in-hand with "reading the tape" (studying past prices). Livermore also discusses "resistance levels" and how he uses them in his trades. Often, a security will trade within a range, because as it rises, selling pressure increases, and as it falls, buying increases. But when a security breaks through a resistance point, it often continues to move in the same direction, according to Livermore. As such, he will take an initial position as the price moves through a resistance level and build on it as it continues in the same direction. "The conclusion that I have reached after nearly thirty years of constant trading, both on a shoestring and with millions of dollars back of me, is this: A man may beat a stock or a group at a certain time, but no man living can beat the stock market! A man may make money out of individual deals in cotton or grain, but no man can beat the cotton market or the grain market. It's like the track. A man may beat a horse race, but he cannot beat horse racing. If I knew how to make these statements stronger or more emphatic I certainly would." I guess consider it a lesson on what NOT to do. Regarding your questions, it's very difficult to say what is "above average" when you're talking about free cash flow, because it will vary by industry. For example, in one industry, margins could be low but the industry might be able to adapt to changing conditions quickly, while in another, margins could be high but fixed costs are high such that risk is higher. To your other questions, free cash flow is useful because it takes in account the costs of assets that need to be replaced to keep the business going (as opposed to EBITDA). The problem is that it's often difficult to know those costs without a very good understanding of the company. Q3: That the securities will come down in value, and that the managers are not interested in rewarding shareholders. One company which is exactly as you describe is ECG, which is discussed here. rayhaan - read the book for the lessons rather than technical analysis, the principles by which you conduct business will follow his no matter what you're doing. He teaches the reader about investing with conviction and there is no substitute for that in any trade.